Body Transformation: Bradley Barth Flushed 26 Percent Body Fat! Bradley started a juice fast that morphed into a nutritious lifestyle. 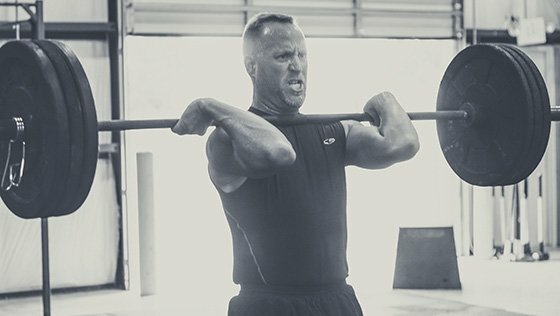 See how he put training secondary to dieting and cut 26 percent body fat at age 45! I was athletic growing up and played almost every sport available to me. I loved the competition and pushed myself to new levels. I was an all-state high school soccer player and turned to recreational sports in college including tennis, snow skiing, and mountain climbing. When I started my first business, I stayed in shape by taking cardio classes and lifting at the YMCA. I also got into boxing at a local boxing gym until it closed. However, married life and having children caught up with me and my focus changed to work and fatherhood. Call it sympathy weight or laziness but when my wife was pregnant I ate a lot. Junk food and fast food weren&apos;t just on the menu; they were the menu. Based on a conversation at work, I decided to tackle a new challenge and run a marathon. I lost some weight, but the training was extremely time-consuming and really boring. I completed the Ridge To Bridge Marathon in Morganton, North Carolina, injury-free, but I was struck by what one of the volunteers said to me on mile 20. She was trying to encourage me and said "Way to go big guy!" I was completely annoyed. I trained hard for months and was completing a marathon but still looked fat and unhealthy. My twin babies Copley and Colton became toddlers this year. When they started walking, it was off to the races. I needed to get in shape to keep up with the toddlers and for my two older boys Caleb and Cooper. It was necessary to stay in shape because my children need a healthy father, so I started researching how to transform my body and life. It may sound corny, but I watched and was profoundly influenced by Zig Ziglar&apos;s video on goals. The first step was to identify my goal, write it down, identify who could help me reach this goal, and set a deadline to attain it. While I trained for my marathon, I went to a CrossFit gym for a couple days per week. I loved it but didn&apos;t embrace the culture because my focus was on the marathon. However, when I looked to transform my body, I remembered my visits and found a CrossFit gym near my house. This gym was founded by Army Special Forces guys, had a great reputation, top-notch trainers, and a great vibe. I was meant to be a part of it. I train at CrossFit Wilmington at 5:45 a.m. on most weekday mornings. To be consistent, I work out early in the morning because my schedule changes too much in the evening with a family of six. The biggest obstacle was reprogramming my internal clock to get up early. I learned that being an early riser isn&apos;t a genetic disposition. Once I made it a habit, it was easy and enjoyable to get up early. It allows me work out, read, make breakfast for my kids, and get some work done before my day starts. CFW has great leaders who make the workouts tough but fun. I&apos;ve never had the desire to be a gym rat. I play tennis 1-2 times per week and keep active in the evenings with my family by taking walks, bike rides, and trips to the park or beach. I&apos;m learning to surf now! I started my journey by fasting. I did a 10-day juice fast and almost went broke from the amount of fruits and vegetables I had to juice to get a full glass. I did more research and decided to do a 10-day liquid fast. It was amazing and totally contrary to anything I thought I knew about fasting. When I got past day 3 the hunger was gone. What started as a 10-day fast turned into a 20-day fast and a new outlook on food. After my fast, I started following a fascinating blog by Mark Sisson and read his book "The Primal Blueprint." More than just eating paleo, I liked Mark&apos;s common sense approach to a balanced life. His 10 rules of living are a cornerstone of the change in my life for the better. There&apos;s no typical weekly workout at CrossFit, but that&apos;s what I like about it. Every day is something new. The mix of Olympic weightlifting, gymnastics, and core training keeps it diverse, fun, competitive, and challenging. Here are the WODs (Workouts Of The Day) from last week. Honestly, the concept that had the most impact was becoming aware of what I ate. I lost the majority of my weight from fasting and eating clean, healthy food. It was easy when I trained my body and mind that I didn&apos;t need as much food as I thought. I lost nearly 50 pounds before I ever stepped foot in a gym or laced up tennis shoes. Controlling your food intake, plus exercise, is the key. "It may not be overnight but small, consistent changes work miracles over time." My future plans are to live as long as possible and be there for my children. My wife is very good-looking, younger than me, and in great shape. She has been great at helping me with serious, life-changing dietary changes. We work together to balance a schedule so we have time to be healthy. Our children will always be our primary motivators. You can hack your mind and body using goals and small tricks to change your life. Some of the tricks I used were to post goal photos on my bathroom mirror, change eating habits by eliminating breads and grains, and to focus on consistency. Most of all, believe that you can and will change. It may not be overnight but small, consistent changes work miracles over time. I love the transformation stories on Bodybuilding.com. It&apos;s inspiring to see people from all walks of life at every age making transformations. I used the search bar often to research workouts, tips, and useful information for overall fitness.